Avenay-Val-d'Or is a charming and ancient village situated in the very heart of the Champagne viticultural area of France. Bordered by the Montagne de Reims to the North, by the Côte des Blancs to the South, and by the Vallée de la Marne to the West, Avenay is the entrance to a small valley formed by the river La Livre. The Romans established the village in ancient times, and first brought viticulture to the area. This exceptionally picturesque valley, with its eastern and southern hillside vineyards, and natural forest mountain peaks, is known not only for its beauty but also for the quality of its products. It is easy to understand why eighteenth century French poets named this region Le Val d'Or (The Valley of Gold). It is in this unique locale that the Morlet family settled over two hundred years ago. Today, the Morlet family vineyards are comprised of over thirty parcels totaling forty acres in Avenay-Val-d'Or (Premier Cru), Aÿ (Grand Cru), Bisseuil (Premier Cru), and Mutigny (Premier Cru). These vineyard blocks are situated next to parcels that produce the super premium cuvées for such famous Champagne houses as Bollinger, Krug, Moet & Chandon, Mumm, Pommery, and Veuve Clicquot-Ponsardin. 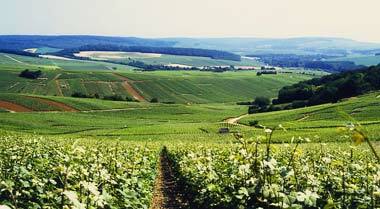 For example, in Aÿ, the prestigious vineyard La Côte aux Enfants of Bollinger, is adjacent to the Morlet family's Gilbertin. Vineyard care is considered one of the most important activities of the Morlet family, who believe that "there is no great wine without great fruit." Thus a walk through their vineyards is like a walk through meticulously manicured gardens. All of the family's vineyards are located on hillsides with a very high density of 3600 vines per acre, allowing for a perfect balance of the vines. This results in healthy and ripe fruit, which express each terroir. Pruning, tying, suckering, shoot positioning, and harvesting are all carried out by hand. The canopy is vertically low to the ground so that the fruit receives optimum sun exposure. The family emphasizes organic composting in order to maintain a live soil, and believes that the vines must struggle to nourish themselves, resulting in a lower yield of the highest quality. 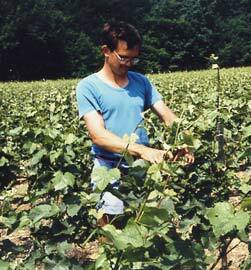 The roots of the vines grow through a shallow limestone and clay topsoil, to a deep and chalky subsoil. The chalk, called Craie à Belemnites plays an essential role in the life of the vines by naturally regulating the water retention capacity of the soils and, therefore impacts the quality of the future wines by providing minerality, acidity, finesse and longevity. Overall, the proportion of the Morlet family vineyards is planted to 76% Pinot Noir and 24% Chardonnay. Continuing the efforts carried out by four generations, the family's focus on their vineyards and stewardship of their land allow them to produce the highest quality fruit and express the diversity of their vineyards.